My grandparents once owned the book De Steenen Spreeken. Translated the stones speak, it was printed in 1950. One day years later and living in Canada it came to mind. Several hours later I entered a used bookstore and laying on a small table was the book. It felt a bit strange because what are the chances? I live in a small town, there is the rarity factor of the book, plus the timing of this incident. But there is no such thing as coincidence. Matt 7:7 perhaps "Ask and receive". As of this writing I have not had the time to read and study it fully, but while leafing through it I noticed some interesting things. Firstly, the end date September 17, 2001 caught my eye, because there is only a six-day difference from another important event date, September 11, 2001. Some of you may know that a calendar is one aspect of the Great Pyramid, where dates of past and future events written in stone can be measured accurately. Some have known this fact for years, and it is just one of many fascinating parts to this structure. The date of 2001 is near the end of this Great Pyramid calendar, not the end of the world, but an event date when a big change in the world would and has happened just as predicted. However, you can see that the big circle extends past the 2001 date. It seems that we are very close to the end of this age, but a new beginning as well when Jesus Christ returns. Prior to that event the “mark of the beast” point in time, where everyone on earth will be required to surrender his or her biometrics (geometric templates). The subsequent observations should be thought provoking. The number .0002861022 from the book and my earlier result 0.000286102294921875 match. Subtracting .0002861022 reduces the numbers in his b column. Width of the triangle 4132.2314...mm (.75625), divided by its height of 2840.9090...mm (1.1)= 1.4545...mm. The height of the light blue rectangle 1742.0454545...mm (1916.25 / 1.1), divided by its width of 1266.94214...mm= 1.375. 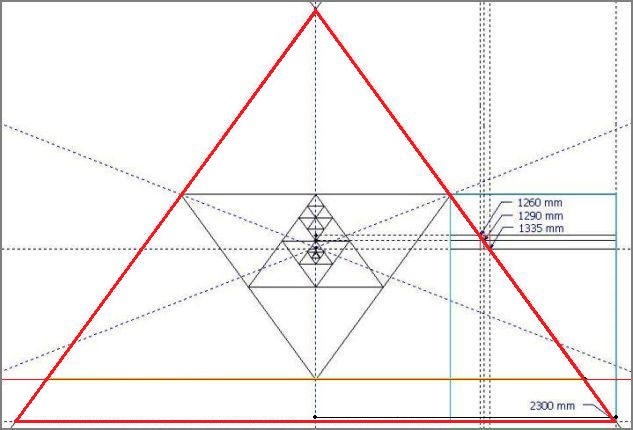 Naturally every other rectangle split in half by the triangle's diagonal line will all have the same ratio of 1.375 (3125 / 2272.7272...) and that number multiplied by 8 is 11 Earth ratio. The numbers on the left side represent vertical measurements starting from the 2300 line, while the numbers on the right are horizontal measurements from the centerline over to the outside diagonal line. Snipped out is a middle section from the above diagram in order to zoom in and show this better. There is a rotating right twisting vortex phenomenon from 1260 to 1290 and on to 1335, where 1335 is now on the other side of the spiraling time and distance vortex, marking a new beginning. The # 's 1331 and 1332 are at the midpoint. Imagine this midpoint idea as a whirlpool, or the concentrated tip of a tornado touching the ground where interesting physics phenomena can occur. A narrowing time vortex of change may indicate stresses in the psychological and physical realm, and be a materialistic, tumultuous and fearful time, versus a time of peace. Since all of creation is connected, this scenario could have a ripple effect throughout the universe. 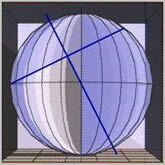 On earth it may cause things such as polarity reversal and severe earthquakes. The Bible clearly foretells that earthquakes and other events will happen (Mathew 24:7, Mark 13:8, Luke 21:11) leading up to "the day of the Lord". Zechariah 14:4 describes an unimaginable earthquake, as well as Revelation 16:18 "and there was a great earthquake, such as was not since men were upon the earth, so mighty an earthquake, and so great." We are near the tip or the cross point, and interestingly it was around 1981 that the barcode system and the beginnings of the biometrics system were set up, just as in Nebuchadnezzar's days when he "set up" the image. The number 1332 is not mentioned as one of the days in the book of Daniel but divided by two it is mentioned in the Bible as the number 666. So, if this is a calendar time scale, the people making it through those Biblical three days (the terrible 666 time) may witness the return of Jesus Christ on the 1335th day. "Blessed is he that waiteth and cometh to the 1335 days"
The last 7 years (2 x 3.5), except God has stated that he has shortened the second part to 5 Months (150 days) "for the elects sake" Mark 13:20, Matthew 24:22 and Revelation 9:5. During the time of Noah the waters increased, then "prevailed upon the earth an 150 days" (Gen 7:24), then gradually decreased, and this connection is food for thought. Compare events now with what was happening during Noah's days. This interesting calculation was taken from the Book of Daniel study at Shepherds Chapel. "From the crucifixion in 33 A.D. when our daily sacrifice was taken away (Hebrews 10), to 1948 and signaling the generation of the fig tree when its shoot was set out (good and bad figs, Jeremiah 24), is 1290 of Daniels days. Therefore, 1948 minus 33 is 1915 of our years, divided by 1290 of Daniels days gives a common denominator of 1.48449, and is one of Daniels days compared to our time today. "Blessed is he that waiteth and cometh to the 1335 days", times 1.48449 is 1981. Then there are 2300 of Daniels days that go by from the time that God cleansed the sanctuary for the last time (Joshua 23), until the time of the end when Christ returns. Multiply 2300 x 1.48449 = 3414 years, and it was in 1433 B.C. when the sanctuary was last cleansed, therefore 3414 subtracted by 1433 is also 1981." If 1290 Daniel days represent approximately 1915 of our years, then 1335 Daniel days are 1981 years. 1335 - 1290 = 45 Daniels days, and 1981 – 1915 = 66 our year or 45 x 1.48449 = 66.8 years. The late Pastor A. Murray from Shepherds Chapel arrived at this common denominator number 1290 by using dates, but when using the new common denominator 1.487157... based on π slightly different dates can be arrived at. Unlike the earlier calculation 1981 is at 1332 (666 X 2) not 1335. Somewhat different numbers are found in the Appendix 179, Companion Bible. Due to a calendar mistake and it is another study, but the idea is that the Lord was begotten "of the Holy Ghost" (Matt 1:18) and "the Word became flesh" (John 1:14) in 5 B.C. on Dec 25, followed by the Nativity (birth) in 4 B.C. Sept 29. Perhaps it was not in 33 A.D. but 29.375 A.D. (April) when Jesus was crucified at the age of 32.625 and counting further to when the word became flesh is 33.375 years. Here is a difference of 4 years and scholars still debate this, but it is a perfect example as to why we cannot and should not try to set specific dates. This is a good time to add that life in the flesh begins at conception. There are too many variables to get an accurate time, just as Jesus had said. No one can predict a specific time and date like some try to do. However, we are probably not that many years away from the return of Jesus Christ. Perhaps the image that Nebuchadnezzar had set up and the thing that the three young men Shadrach, Meshach and Abed-nego refused to bow down to was in the shape of a 6x6x6 cube, a symbol of the earthly king and his kingdom. Each of their names appears 14 times in the KJV, (14 x 3= 42) or (6 x 7), and 42 Months is 1260 days or 3.5 years. So, 4662 divided by two is 2331, and it is the mirror of 1332. And 2331 minus 1332 is 999. Three figures are a concentration of a particular number. Some examples of this are Sodom 999, the number of judgment (finality); Jesus, 888; The Lord God made, 888; Damascus 444, the world number; The beast 666, the number of man1332/2= 666. Syria’s capital is Damascus the oldest city in the world, and interestingly the number of its name is 444. We are not to worship and bow down to any created thing or what it may represent, nor angels, but only to God. It is not geometry, numbers, or chemistry that is bad, it is how it is used and what it is used for. There is important information belonging to God's creation that is even now selfishly hidden away from ordinary people by a few. In other words, pi-rates have stolen things which do not belong to them. They think that by leaving breadcrumbs here and there (clues in architecture for example), they are save when the master returns and may try to justify their actions by saying like the servant with one talent, we hid it from everyone else but saved it for you upon your return. The 5, 2, 1 talents story in Matthew 25 explains that the servant with the 1 talent had hidden it and tried to give it back to the master upon his return. The master was angry with him, the servant lost his talent, and it was given to another servant, and finally the bad servant was cast into outer darkness. God is the Designer and Creator of His vast Creation, visible as beautiful geometry and perfectly designed to the finest detail. However, something good can also be used for evil. Here is an example: We are created in God's image and belong to God, which is good. However, it is evil when we are forced to hand over the blueprints of our God created designs (to man), so that we may participate in this world. Permission from man? When a person has a biometric scan taken, it means recording geometric points and lines between key points on the face, eye, etc. in 3-d! This data converted digitally into ones and zeros, becomes an image or cube shaped mathematically, and an individualized Barcode! It is not an innocent picture, it is a 3-d mathematical sculpture, where your body becomes the I.D. and your final number! Visualize all of the individual cubes containing people’s information linked and stacked together making up one large cube, which is centrally controlled. Therefore, if you are not part of this unit when this thing is "set up" fully, you will not be able to "buy or sell" or travel etc. Try traveling now without giving up your biometrics! This is very important information to understand! Thankfully others do as well such as: Bob Fraley, The Last Days in America, 1984: "The interpretation of the Universal Product Code marks is most revealing in that the three numbers '666' are the key working numbers for every designed Universal Product Code. Every group of Universal Product Code marks has in it three unidentified numbers. All three of these numbers are 6, making the use of the numbers '666' the key to using this identifying marking system. . . There is no deviation. Every Universal Product Code has three unidentified marks whose number equivalent '6' encoding it with the code number '666'." We have become the product, and no product has control over itself. To know the exact date when Jesus returns is not for us to know (days and hours) because only God knows this. However, we should not be clueless regarding the season (months and years) and his return to Earth, as well as other prior events such as the mark of the beast time. Mark 13 "28 Now learn a parable of the fig tree; When her branch is yet tender, and putteth forth leaves, ye know that summer is near: (indicates season) 32 But of that day and that hour knoweth no man, no, not the angels which are in heaven, neither the Son, but the Father." 1 Thessalonians 5: "1But of the times and the seasons, brethren, ye have no need that I write unto you. 2For yourselves know perfectly that the day of the Lord so cometh as a thief in the night. 3For when they shall say, "Peace and safety"; then sudden destruction cometh upon them, as travail upon a woman with child; and they shall not escape. 4But ye, brethren, are not in darkness, that that day should overtake you as a thief. 5Ye are all the children of light, and the children of the day: we are not of the night, nor of darkness. 6Therefore let us not sleep, as do others; but let us watch and be sober. 7For they that sleep in the night; and they that be drunken are drunken in the night. 8But let us, who are of the day, be sober, putting on the breastplate of faith and love; and for an helmet, the hope of salvation. 9For God hath not appointed us to wrath, but to obtain salvation by our Lord Jesus Christ, 10Who died for us, that, whether we wake or sleep, we should live together with him." Since 9-11 we hear Peace and security constantly! In John 21:11 153 fishes were caught with a net and in another place 1 fish caught was with a hook. If 153 + 1= 154 and 7 x 7= 49, then 154 divided by 49 is 3.142857 i.e. 22/7.